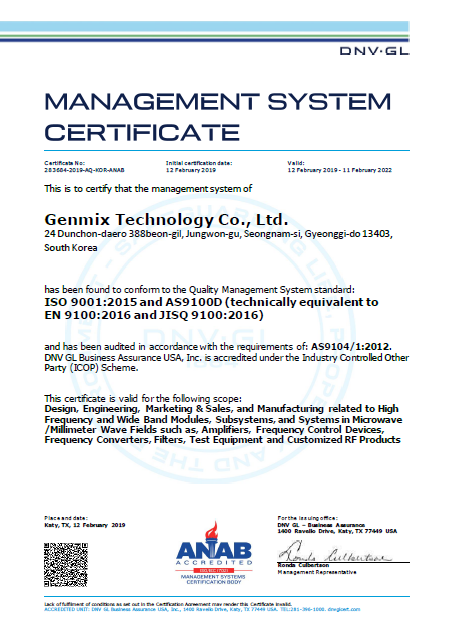 Genmix is proud to announce that we are AS9100D Certified. AS9100D is a widely adopted and standardized quality management system for the aerospace industry. It was released in October, 1999, by the Society of Automotive Engineers and the European Association of Aerospace Industries. Genmix Technology’s clients across aerospace, SatCom, defense, commercial wireless and laboratories trust us to design and manufacture products that meet the most stringent quality-control processes. With our world-class AS9100D certified quality management system in place, we will maintain the industry leading quality insurance. The company you should look for innovation.